interested in the professional China Watchers, a once nearly-defunct claque of people working in government for national political ends, journalists, academics, ne’er-do-wells, as well as the talented curious and literary dilettantes. In the ‘New Epoch’ of Chairman of Everything Xi Jinping, the long-overlooked, or underestimated, skills of being able to read, listen to and understand the bloviations of the Chinese party-state are, perhaps, in vogue once more. Ian Johnson is a prominent writer and reporter whose work has appeared in leading international publications for many years. He is also the author of a number of books, the most recent being The Souls of China: The Return of Religion after Mao (New York: Pantheon Books, 2017). He kindly responded to our request to introduce how he became involved in studying Chinese and writing about China. The giant writing factory that churns out banal travel articles must have one scribe who specializes in writing about Montreal and neighboring Quebec City. Every week, some newspaper somewhere prints a variation of this chestnut: go to Europe in North America! See all the charms of France without having jetlag! For visitors a lot of this is true. Montreal is a city with great flair and charm, but this happy story masks tensions caused by language and history, issues that shaped how I eventually pursued what became my vocation: covering China. When I was a child, a strong separatist movement wanted to make Quebec, the province where Montreal is located, an independent country. A terrorist movement existed for a few years, with letterbox bombs and kidnappings. We were told not to use letterboxes or they might explode, and every morning for a few months I would walk to elementary school warily eyeing the big metal containers on the street corner. Our family was Anglophone, while the majority of Quebec, about eighty percent, was Francophone. In Montreal about one-third were Anglos, the linguistic descendants of the British who had defeated the French in an eighteenth-century war, winning control of the colony of Quebec. For about two centuries, many Anglophones like us had lorded it over the French in Quebec, especially in the city of Montreal — which used to be Canada’s biggest and most important city. Montreal’s language of commerce was English, and the big department stores and banks operated in English. If you were Anglo, you basically could demand that people speak to you in English and indeed many people from my parents’ generation spoke little French. One aunt left Montreal in the early 1970s and years later, when I asked her why, she said, ‘the French were getting uppity.’ My aunt had a starch sense of humor but it reflected an unpleasant feeling among many Anglos that times were changing. My parents were different. They made sure we understood that learning French was not only practical, but also the right thing to do. This was the language of the majority population; we weren’t going to demand that they speak our language; we must speak theirs. How else could we communicate with them? My parents spoke decent but heavily accented French. My father gamely brushed up on his French (he actually grew up mostly in British Columbia and only arrived in Montreal shortly before university) by reading Ian Fleming’s James Bond novels ‘in the original French,’ as he joked. He also hacked his way through George Simenon’s more complex crime novels. My mother had a knack for languages and would imitate people we heard on the street, but in a nice and funny way, so our ears slowly became attuned to different accents and languages. One of our neighbors was André D’Allemagne, a congenial professor and a founder of the non-violent separatist movement. We shared a semi-detached house: he lived on the other side of our living room wall with his second wife, Viviane Racette. They had all sorts of famous people over for dinner, like the independence leader René Lévesque. This made André seem exotic but my father really warmed to him because their grass wasn’t mowed too carefully and they didn’t obsess about their flower garden. Instead, they had a great library, red wine, and clouds of cigarette smoke. When the government cracked down on the terrorist movement, Mr. D’Allemagne went to his cottage in the countryside just to make sure he wouldn’t be caught up in the dragnet. My father took in his mail because he knew that André was a decent man and that the Francophones weren’t our enemies — they were our neighbors. One effect of this unrest was to make the government push the Anglos to integrate better. A few years later when I was in the seventh grade, the city offered French immersion classes. My parents made the decision to send me and my sister to one of these schools and suddenly I was taking every single class in French, except English. That meant mathematics, geography, history, and science — all in French. In the first semester we could speak English in the corridors and playgrounds but that ended in the second semester. Teachers monitored us to make sure we kept to French. It wasn’t as bad as it might sound because we were all in the same situation: Anglo kids who’d had French class for six years but spoke English the other twenty-three hours of the day. It was a shock but children’s brains are flexible. Later that year I bought magazines in French, especially anything to do with the local ice hockey team, the Canadiens. Unfortunately, my family moved to Florida when I was fifteen. We lived in a suburb of Tampa, which is a perfectly pleasant city and where I made many friends. But I missed Montreal horribly and wanted to get out. I was rather aimless, however, and didn’t do the logical thing, which would have been to apply to Montreal’s McGill University. Instead, due to a series of reasons — some silly and some sound — I ended up at the University of Florida, about two hours away from Tampa. It had a nationally known journalism program and I thought I would enroll in it. When I got to the university, however, everyone was abuzz about a visit the year before by The Washington Post’s deputy foreign editor, Karen DeYoung. In a big speech at the journalism school, she advised students not to study journalism. At least how it was related to me, she said that journalism is a trade that one best learns by doing, perhaps leavening this practice with some elective courses in journalistic ethics and law. That made sense to me so I began working at the school newspaper and cast about for a suitable major. I thought law or medicine would be fine — I could write about legal issues or health with real insight. But my eye was caught by a bulletin-board notice. It had been posted by a linguistics professor named Chauncey Cheng-hsi Chu, who was looking for students to fill out a section in beginning Chinese. My father was working for Swire, the big Hong Kong conglomerate, and had made a trip or two to Asia, bringing us back a wooden junk and a Japanese doll. Maybe this played a role, although I don’t think it actually did. I think what drew me to China was simply the desire to experience a completely different culture. The world seemed vast and Florida dull. I knew that if I stayed in Florida I would need to learn Spanish — my upbringing in Montreal made that clear to me — but that was just another Romance language. I wanted something different. So I signed up for Chinese. Dr. Chu was a great teacher. He was in the process of writing a grammar book on Chinese and regaled us with tales about the difference between sentence-ending particles like le and ne. It wasn’t Victor Segalen, but it was fantastic, like a puzzle or game that he brought to life with his exuberance and devotion. He also took us to Chinese restaurants and had two excellent grad students from Taiwan who were patient tutors. I took another year but my Chinese remained lousy. This wasn’t the teachers’ fault. Instead, the University of Florida didn’t demand enough of its students and we always slid through the exams with minimal effort. I think Dr. Chu perhaps also knew that if he was too strict most students would drop out. So he passed us and gave us something maybe more important than the knowledge of another few hundred Chinese characters: he gave us the love of the language. I realized, though, that I’d never make progress in Florida. It was a problem I knew from Montreal: one hour a day on a language isn’t enough. 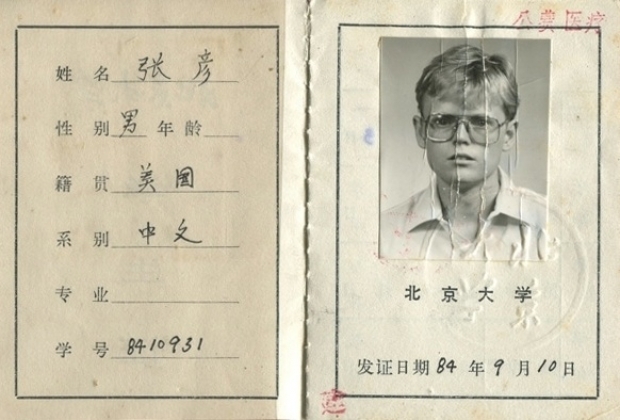 So in 1984 when I heard about a study abroad program that would allow me to go to Peking University, I jumped. When I got there I found out I was right: my Chinese sucked and I was mercifully put in the beginners class. That, along with being surrounded by grad students in my dorm who could speak Chinese, jolted me awake. I began studying hard, traveling around the city by bike, and also researching my senior thesis on journalism in China. My conclusion was that foreign reporting was wanting, in part because of the inability of most foreign correspondents to speak the local language. When I wrote the paper, I thought back to Montreal. The journalists seemed like my aunt, grumbling about the locals but not really understanding them. I wanted to be able to speak directly to China’s André D’Allemagnes and decided that before I did too much more journalism, I’d work on the language. In 1985, I went back to Florida and took a job at a local newspaper to gain a bit more practical experience and to pay off some college loans. But this was just a pragmatic detour. I knew I needed to get back to the Chinese-speaking world. Again, Dr. Chu helped out. His classmate ran the Mandarin Training Center at Taiwan’s National Normal University. I heard from people that you could teach English in Taiwan for $10 an hour and that a room in a flat might be about $100 a month. So it seemed feasible to teach English and spend most time studying. Dr. Chu wrote the introductions, I sold my stamp collection and cashed in a savings bond that my great-grandfather had given me when I was born, and I set off for Taipei. I was lucky because I roomed with a truly inspiring person: Nigel Wiseman, a linguistic genius who had become bored of Europe after mastering German, French, Spanish, Portuguese and Italian. After a few years in Taiwan he was fluent in Mandarin, conversant in Hokkien and was learning Cantonese. Living with Nigel meant that there was no question about not learning Chinese — how could you do anything worthwhile without knowing the language? After a day of studying and teaching, I’d come home to share with him a small bottle of Wu Chia Pi, a medicinal liquor that we’d sip at the kitchen table. His passion was Chinese medicine and he was in the process of compiling a dictionary and translating probably his fourth book on the topic. He’d talk about how most books about Chinese medicine were New Age nonsense because the people writing them couldn’t read Chinese — and didn’t really care to, either. The main thing was that it fit into preconceived notions about yin and yang and going with the flow. Nigel was well into what became an amazing career as the most influential English-language translator of Chinese medical texts, with a huge body of work and a rigorous methodology. One thing I learned from him is that with language there were no shortcuts; you had to put in the time if you wanted to respect the material. At school, I studied textbooks on idiomatic expressions and famous stories from Chinese myths. But things got interesting when I switched to a newspaper reading class with a very severe teacher, Gao Tzu-liang, a KMT member who had worked in the Ministry of Education. He had fled to Taiwan in the late 1940s, worked in the ministry and now was retired. He was in his 70s and insisted we read Central Daily News, the KMT’s official newspaper, although in moments of weakness he allowed us to dabble in the more independently minded China Times, and United Daily News. Mr. Gao was funny, especially when we first asked him permission to read something other than Central Daily: ‘Too many printing errors in those other newspapers.’ But it’s also true that Central Daily News, at least back then, was a meticulously written and copyedited newspaper. The other newspapers added a bit of spice. For fun I went to a cram school to read Lu Xun and other modern classics that still weren’t quite legal in Taiwan. The Taiwan experience was important because it exposed me to real Chinese, not the peasant Chinese that one found in mainland newspapers, especially back then. Instead, I was reading solid, high-brow Chinese, replete with idiomatic expressions. It also made me familiar with many terms and styles derived from classical Chinese, although I didn’t study that until a couple of years later. Later I did learn classical Chinese when I went to Berlin in 1988 to study Sinology at the Free University of Berlin, and twenty years after that I took a refresher for two semesters at Harvard while on a fellowship there. I think classical is helpful for a couple of reasons. One is that it involves a bit of cultural grounding. It’s somewhat analogous, say, to reading Edith Hamilton’s Greek myths. The difference is you’re doing it in the original language, but you don’t need to learn an entirely new language because classical Chinese is quite close to modern Chinese — I’m not sure the proper analogy but it might be like learning to read Chaucer. It also makes you familiar with the phrases and terms that educated people like to toss into their essays. I went to the Free University of Berlin for personal reasons — I met a young German Sinologist in Taiwan who later became my wife — and over time came to see the advantages of the old-school continental system of studying a country like China. Unlike U.S. universities, German schools unapologetically traffic in ‘Area Studies’ — in other words, Chinese Studies, instead of making young academics into historians, political scientists or literary theorists who happen to specialize in China. I understand why this is frowned upon in the United States. Academic fields are considered to be (dare I add ‘pseudo-‘?) scientific disciplines and one is supposed to master the reams of theory in historiography, political science or literary science before specializing in one country or region. This has the advantage of making one familiar with general theories before looking at one country. It is also mean to de-exoticize and de-mysticize a country, and make it just another case study that can be investigated by broader rules and ideas. But the disadvantage is that it can encourage students to parro the latest academic fads and try to get a country like China to fit them. In addition, it can lead a historian to knowing all about global historical theories and even Chinese history, but little about Chinese literature, religion, and art. And this leads to largely unreadable books that regurgitate theories without being able to draw links across disciplines — a narrowness that makes many modern academic works unappealing to a wider readership and generally unsatisfying. So while I decided to write my thesis on China’s economic development — a useful topic that gave me an area of expertise that most economically illiterate journalists ignore — I was also able to take courses on Qing history and Ming literature. Maybe this was simply perfect for a superficial journalist, but I found the practice so stimulating that now, in 2018, I’ve signed up to write a PhD at another German university, Leipzig University, on religious groups and civil society. Living in Berlin also gave me an interesting perspective on China’s development. I remember traveling through East Germany in 1988 and thinking that the country was in deep trouble economically. But I was sure that most observers were right in saying that East Germany was the most Stalinist of East Bloc states and would be the last to fall. I never imagined that within two years the state would cease to exist. That’s made me realize that even a seemingly impregnable state can collapse; perhaps a useful reminded when thinking about today’s China. Eventually I was freelancing more and more for Baltimore’s The Sun newspaper, which was probably the smallest U.S. paper to have a Beijing bureau. I figured, correctly, that would make it easier to get to Beijing without having to, say, work on The New York Times’ Metro desk for years. In 1992, The Sun, hired me and brought me to the United States for two years of seasoning with the unspoken agreement that if I did well, the Beijing bureau would be a possibility. I think also there just weren’t too many people gunning for that job and so in 1994 I was sent to Beijing, where I worked for The Sun for two and a half years before switching over to The Wall Street Journal. I’ve emphasized language maybe to an excessive extent. I must emphasize that language is a tool. You don’t have to know Chinese to be a competent reporter covering China. Journalism requires many skills, such as an ability to gather and organize information, analyze events, make contacts and, of course write. And over the years I’ve worked with many good journalists who don’t speak the language. They possessed many of these other skills and overcame their language barriers through hard work. I think for me, given my background in Montreal, it became essential but this is perhaps just a personality quirk. However, I believe that knowing the language is essential if you want to try other forms of writing, especially book-length narrative non-fiction. I have made this argument elsewhere but the basic point is that it’s the only way to get close to people, know their thoughts, recreate internal dialogue, and in general get to what Lung-kee Sun calls ‘the deep structure’ of Chinese, or any, culture. For much of my career, this has meant trying to report on grassroots China. In the 1990s I even thought that dissidents and intellectuals were something of a waste of time. Perhaps because this was the era right after Tiananmen, I felt that answers had to be found in slow, glacial changes at China’s grassroots, a view that informed my first book, Wild Grass. But in this new era of Chinese history, I’ve expanded this to include a series of interviews with prominent Chinese thinkers. These are elites trying to change the system, sometimes through art or writing, and who maintain their tenacious efforts to open society despite increasingly draconian efforts against them. They sometimes include classic dissidents, such as Liao Yiwu or Ai Weiwei, but I focus mostly on the women and men tizhinei, or inside the system, because I think they have more of an impact inside China, than the dissidents who are largely censored out of the Chinese conversation. Despite this engagement with Chinese culture and language, I try to keep a sense of detachment. It’s not that I don’t care about China — obviously I do, very much — but I’ve always thought of China as an object of study and not my best friend. This doesn’t mean being blasé. I’m not the sort of observer who takes a picture of a guy lying on the side of the street and doesn’t help. If there’s an acute human problem, I try to help, but within certain bounds. I’ve been asked to be a mule for dissidents: carry this memory stick out for me. Sorry, I don’t do that. It’s not the risk — that’s actually quite minimal — but you start with that and then you’re part of their team, which I am not. Working in China is not being in an adventure movie with good guys and bad guys. It’s carrying out an important, to me almost a sacred task, that I won’t screw up by trying to be some John Reed wannabe. In short, I try to keep my distance. It’s better for everyone and has allowed me to keep my sanity while working on some very difficult topics for twenty years on the ground. 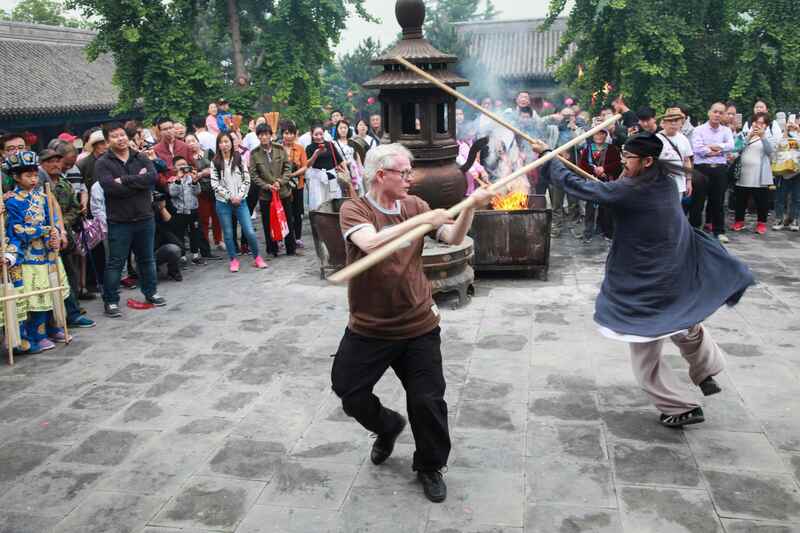 I also realize that as a foreigner I will never be Chinese, no matter how many stick-fighting routines I master. But for a China-watcher, this can be liberating. To be Japanese in Japan was to be caught in an almost intolerable web of rules and obligations. But the gaijin was exempt from all that. He could observe life with serene detachment, not being bound to anything or anyone. This is not a suitable frame of mind for everyone, but for someone who grew up as a minority in a fragmented society, it’s one that fits me. See a forthcoming series of essays on the value of learning Chinese, edited by Perry Link.